Enterprises with the passing time, are increasingly facing the challenge of aging and old software applications, better known in computing parlance as legacy applications which are essential for the organizations but at the same time prove to be a nightmare for programmers and maintenance engineers. Though burdensome, legacy applications also represent years of accumulated experience and knowledge. It is, therefore, unwise to discard them before building new state of the art applications to leverage current technologies. There is a need to transform such legacy applications, suitable to the latest technology environment by various methods. For maximizing value, application reengineering is being increasingly embraced by organizations. Paradigm has been working on legacy applications since the time of Y2K problems that had turned the world in a spin when the millennium was ending and with which was ending the hope and fate of thousands of applications worldwide for their inability to recognize new date. Since then, we have developed special skills in reengineering through our own proven methods and experience. Our extensive experience and R&D strengths provide tool-based processes to achieve relatively painless reengineering of applications and help organizations reach their objectives efficiently and effectively. Paradigm can rapidly and effectively reengineer your legacy software applications to contemporary platforms with optimized architectures, simultaneously retaining or enhancing the value of those applications. We bring together our proven processes, technology expertise and tools to reengineer your software applications to modern technologies such as .NET and J2EE. Our global development centers have software programming teams with proven expertise in modifying or extracting business logic from legacy systems. Paradigm’s mature programming processes, proprietary methodologies, flexible global delivery model, and stringent quality management systems minimize project development cost; reduce time-to-market and ensure highest quality for our clients. Our best practices in application reengineering along with proprietary tools deliver optimized and cost-effective projects as solutions. Proven processes, technology expertise and tools to re-engineer your applications to modern technologies such as .NET, J2EE, UNIX and Linux. Rapid action and effective re-engineering on your legacy applications to contemporary platforms with optimized architectures, simultaneously retaining or enhancing the value in the applications. Proven expertise in modifying or extracting business logic from legacy systems. We follow a structural approach where we analyze your legacy applications, dig out the business rules, employ the latest tools and development techniques and transform your legacy systems into contemporary applications. Greater flexibility to respond quickly to market changes with scalable platforms, reduction in cost spent on out of control legacy systems and reduced total cost of ownership. We assess existing legacy systems to formulate a reengineering roadmap which aligns the selection of the proposed IT solution to the organization’s business vision and needs and also maximizes ROI realization. Assessment includes recommending or deciding on the appropriate business and technical target architecture, evaluating build or buy opportunities, and choosing between one time and incremental system reengineering. Paradigm can reengineer user interfaces for enhancing ease of use, from look & feel enhancements to rewriting & redesigning interfaces among different technologies. Technology upgrade presents an ideal opportunity for analyzing and improving processes in an organization. 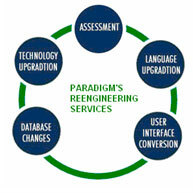 Paradigm’s technology upgradation methodology examines key business process areas to identify high ROI changes. The approach also ensures minimum customization by exploiting existing processes that have been implemented in applications.